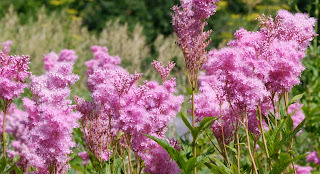 The common Joe-Pye Weed (Eupatorium fistulosum), dosen't have flashy flowers. But, the swallowtails and other butterflies sure do love them. Close inspection of the large, pink flowerheads will result in finding numerous bees, wasps, butterflies and other assorted critters. Some of these flowers in my yard have reached 8 feet tall, they sway with the breeze and attract many visitors. The Joe-pye is common throughout the region and prefers moist areas. The Eastern Tiger Swallowtail (Papilio glaucus) is probably the most noticable butterfly of our region, during the month of August. You may not know that the female is more often black as opposed to yellow. This is one of natures' ways of mimicing. The black form females resemble the Pipevine Swallowtail and are less likely to become bird food. The most common larval host species is Yellow-poplar and black cherry.Although, there is usually a caterpillar to be found on the spicebushes in my yard. These large and plentiful butterflies will be found feeding upon the flowers of Joe-pye Weed, Ironweed, milkweeds and thistles. Therefore, they can be found at nearly every location. I have never gotten very excited about growing potatoes. I always plant about 10 pounds of seed potatoes in the early spring and forget about them. They grow, I hill them when they get about 8 inches tall, they proceed to get eaten up by potato beetles, bloom and die back. Then I usually get a few potatoes. This spring I had some compost left over and planted some Yukon Golds, in a new location. They were planted in pure compost. These plants never had any pests present, they grew about 4 feet tall. Last week; I noticed that they had produced fruits, resembling cherry tomatoes. I had never seen this before and looked them up. Healthy potato plants produce these fruits. The fruit is poisonous; being a member of the Nightshade family. They also stay green through maturity. Now I know. I guess that I had never seen a truly healthy potato plant before this year. How to Garden Potatoes the Easy Way! You can visualize the morning. A heavy frost has melted and each puff of breeze sets off a cascade of falling leaves. Standing on a hardwood ridge, you can see a montage of nature’s colors. I, along with two good friends and a pair of the best turkey dogs that ever lived, stood on an Appalachian ridge one late-October morning. One friend mentioned that I had that “far-away look” in my eyes. He was right; I had decided this morning that numerous changes had to be made in my life. We tend to take for granted the things that are present in our everyday lives and gradually forget about things that are no longer available to us. The two things that triggered me on that morning were, the smell of frost and autumn leaves. Yeah, I can smell frost, you can, too, if you really try. For most of the two previous decades, I had either been in the swamps of the Deep South, or the salt-marshes of Delmarva. I didn’t know how much I missed Appalachian autumns, until that morning. Maybe the pre-dawn climb to the top of the mountain cleared the marsh mud and the turpentine odor of loblolly pines from my olfactory system. I do not know, but something happened to me on that day. Within a year, I was living back in the hardwood hills. The next time you are on a mountain stream, take time to enjoy the aroma of crushed hemlock and ferns. Bow your head for all of people in this world, who have never smelled freshly mowed grass or a hayfield. Think about the summer air after a brief evening thunderstorm. Can you smell the breeze? It is more pleasing than exhaust and asphalt isn’t it? Take the time to become more aware of your surroundings; you never know what you will miss, until it is gone. Notice the earthy aromas of morels and fresh compost. Picture in your mind a hillside covered with black locust in the late-spring. Now breathe. I have never thought that the sweet aroma of ramps was disagreeable. The smell of ramps, bacon and fried potatoes drifting from a streamside campsite is a sure sign of spring in the mountains. We have heard the statement every year, at the post office or country store, that a certain person really is unpleasant during the ramp consumption season. The truth is, they probably didn’t smell real good prior to eating their wild leeks. Give credit where credit is due. I may be strange, but I like a hint of distant skunk in the breeze, it has a sticky-sweet pleasant aroma, from afar. Take the time to be aware of the surroundings that are too often taken for granted. You have heard it before, “Wake up and smell the roses.” It may rejuvenate your life. This article first appeared in Two-Lane Livin/Oct 09. I often wonder why some people seem to have at their disposal, all of the time in the world. They must not have; homes, children, pets, jobs, lawns or gardens. I was traveling up the North Fork one Thursday in March. Between Petersburg and Seneca Rocks, there were about 40 vehicles parked along the highway at various pull-off spots. The occupants were not fishing, they were waiting. Waiting on the fish truck. I am sure that they arose early in the morning to drive to a location to reserve their space for sitting and waiting. They wasted their morning sitting and waiting on something that never happened. They did receive one glimmer of hope. While I was at the Seneca Rocks intersection, a hatchery truck passed me and was headed towards Petersburg. I can just imagine the smiling faces on the North Fork as they saw the truck approach and then drive on by their carefully selected waiting area. I looked on the Division of Natural Resources website, the truck had been to Spruce Knob Lake and was returning to the Petersburg Trout Hatchery. The North Fork didn’t receive its weekly allotment of trout until Friday. I am sure that the same crowd was waiting for their arrival. They probably didn’t have anything else to do. We often have to make something good out of a bad situation. I also tend to look at the feasibility of a particular endeavor before going ahead with it. I quit “going fishing” when gas hit 2 dollars the first time. No, I didn’t quit fishing. During the year of 2007, I caught trout every week of the year. I caught smallmouths from the third week of April until the week of Thanksgiving. I never fished more than 50 minutes and all of the time spent fishing was between 11 am and 12:30 pm. There were three days that I didn’t catch anything. I just started leaving for work a little early and fished somewhere along the way. The key to making this type of fishing successful is having your equipment ready and using a lure that appeals to multiple fish species. You do not have time to be fiddling around with equipment. It is very important to make the first cast count. Most of the fish that I caught in 2007 were on Clouser minnows. The only other lures used were Rebel crayfish and Rapala jerkbaits. Keep it simple and you will have success. Do not fret over the time of the day that you can make use of. You will be pleasantly surprised at high noon fish activity, if that is the only time that you have. If you don’t go, you’ll never know what you may be missing out on. May is primetime to get out and steal some minutes from the day to pursue something that you would rather be doing. As we get older, the” I’m a Gonnas” become nearer and nearer to” I Wish I Would Have”. Don’t let it happen to you. Be creative and find some time for yourself. In this busy world, we are often in too much of a hurry to fully take advantage of opportunities we are given. It is really a shame that we do not take time to enjoy the wonders of nature. I was driving through Canaan Valley to make a delivery on Friday and was within twenty minutes of my destination. I noticed some honey bees swarming in a fence row. I thought that I should get some photos on the way back and traveled on. After about 4 miles, something made me turn around and go back to get the photos. It was quite an experience. I pulled my truck as close to the bees as I could. They weren't exactly in a docile mood. I only was able to take 3 photos, before the inside of my truck was filled with bees. By that time, my dog was hiding on the floor behind the seat. Niether one of us were stung, but it was an interesting minute for both. I planned on stopping on the way back through, in hopes that they would settle down. When I came back there wasn't a bee in sight. They had already moved on. Never let an opportunity pass, you never know if another will present itself. Many of you have asked; why I do not submit more articles to various publications. This article may help you understand my feelings about this subject. I can vividly remember the monthly anticipation of receiving my magazine subscriptions . That was during a period of time; when there was something at the post office, other than bills. I always subscribed to the big three: Field and Stream, Outdoor Life and Sports Afield. Organizational publications were also highly anticipated. Each issue was read cover to cover, upon arrival. I hunted, fished and trapped every day, or was thinking about doing so. I dreamed of becoming an outdoor writer. Outdoor knowledge and woodsmanship, are abilities which require time and effort to develop. My skills grew and knowledge developed. I began to question some of the things that were being printed. I began to realize that the same facts and fallacies were being used over and over. I was working in a sporting goods store, with a large magazine selection. I was exposed to everything that was being published , on a regular basis. A few thing that every outdoorsman should know, are that you can never call a turkey down-hill or across water and always remember that the musky is the fish of 10,000 casts. Store employee boredom became unbearable. It was time to move on. I quit and drove to the Eastern Outdoor Sports Show in Harrisburg, PA. I went job hunting. I got a job, as a turkey hunting guide at White Oak Plantation, near Tuskegee, AL. Life had just gotten a lot better. The first writer that I remember being exposed to at that time was J. Wayne Fears. I was quite impressed. His knowledge and skills were immediately evident. He showed all of the qualities that I had expected. He was real and as they would say in Alabama, “ He knew how to act right”. Sadly, things began going downhill. Shortly thereafter, I noticed the guest list for an upcoming hunt. On the list was a writer who’s work I really enjoyed, I couldn’t wait for his arrival. What a major disappointment; as soon as he walked into the room, it was obvious that “This fellow ain’t right”. He showed absolutely no outdoor ability and was clearly, “a bit touched in the head”. Yes, he is still writing, 25 years later. By the time deer season had finished, my thoughts on outdoor writing had been demolished. I had dubbed writers “the parasite pack“. Don’t get the wrong idea yet. I crossed paths with some fine people, who made there living in the outdoor writing profession. The problem was that for every writer who was a joy to be around and did what they said they would do, there were six more taking up space. I quickly learned that if, for example: Jim Spencer, Dr. David Samuel or Jay Langston, said that something happened, it was true. I also learned to avoid the ones that walked around saying, “I can make you famous”. I believe that my main turn-off for the profession was the photography sessions. I’m glad that I was able to witness these photo shoots, because I would never have believed how bad it was. I was really disgusted when a couple of writers would procure a buck from the meat cooler for photos. These writers would never have anything to do with the harvesting of this fine buck, but they would be smiling over it in magazines for years to come. They were always careful to get as many different poses and backgrounds as possible. They also were sure to use various types of weapons for the photo sessions. My reading of outdoor magazines soon became minimal. Fifteen years later, I was driving through the mountains of West Virginia, wondering if there was a way to make a living and still live in the state. The latent desire to become an outdoor writer was awakened. I found, during an internet search: Roger Brunt’s: North American School of Outdoor Writing. Shortly thereafter, I was talking with a friend about things we wished that we had done. Outdoor writing again came to the surface for me. When he asked me why I hadn’t pursued it in the past, I told him. His response was “You don’t have to be like them”. He was right. I had no idea where to begin, but I started the ball rolling. NASOW is highly recommended for anyone; who like me, had no previous writing experience. The information and comments provided in the course are invaluable for anybody who is considering a writing career. I read numerous outdoor type magazines, while I was completing the provided course work. I read a few excellent articles. I read many others good and bad. I also read a few articles that left me wondering, why they were ever published. I found a fishing author who I really liked. I enjoyed his articles and particularly liked one that he did about Florida fly-fishing. Alas, he did an article about one of my home streams. The piece was about fall trout fishing on this stream, which I am very familiar with. The article began with the source of the stream, which was wrong. He then began a discussion about how well stocked the West Virginia Division of Natural Resources keeps the stream’s waters. He notes that it is supplied with fish by the WVDNR two times during the month of October. This stream is not, nor has ever been, on the fall trout stocking schedule. It is practically dry in the fall months. The communities that rely on this stream for a water source, need to have water trucked in during the summer and fall. This has been necessary for at least 30 years. Finally he tells of getting away from the road, while fishing this stream, for a “wilderness experience.” In reality, this stream is synonymic with the road, which it follows. There may be two short stretches in the entire flowage where you may be able to get 75 yards away from the roadway. On the majority of the fishable sections, you must wait for traffic to pass, before you can make a backcast. I truly wonder if this author has ever visited this stream’s waters. I also question now, if he has even been to South Florida.Integrity in outdoor writing should not require rules, regulations or by-laws. Integrity in all communications should come naturally and not be governed. I polled a few people, who I knew had achieved a lifetime of outdoor success. The results were the same with all. They read very few outdoor magazines. The reason was that they knew reality and grew tired of the fluff. 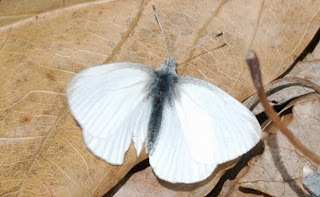 The West Virginia White (Pieris virginiensis) is a woodland butterfly, which is found in the mountain regions. This butterfly can be found in forest clearings during April and May. the preferred host plants are rockcresses and toothworts. I photographed one ovipositing on a garlic mustard at Mingo, in Randolph County. The Spiny Oak Slug (Euclea delphinii) can be found from June to October. The colors of this caterpillar are highly variable, ranging from tans to greens and oranges. It feeds on many woody plant species. This one is on a blackberry leaf. The Common Wood Nymph (Cercyonis pegala pegala) is a common butterfly of streamside habitats. It can be found from June until September. They are very common in the Canaan Valley area. this butterfly prefers to feed on sap and fermenting fruits. The caterpillar can be found on Poverty Oatgrass (Danthonia spicata) and members of the bluegrass and bluestem grass families. Redington Crosswater 9062 Fly Rod Outfit 6 wt. 9 ft. I have never been one to not think much of August. Watching tomatoes turn colors and picking little fuzzy bean beetle larvae gets old, really quick. One August evening, intolerable boredom set in. I loaded up my fly rod, a fifty foot leash and a hard-headed beagle into my truck and drove a whole quarter of a mile to the river. I normally fish there once per year and hadn’t been down there yet. I wasn’t expecting much action. At least, the dog would have some fun. I went to a section of riffles, above a railroad trestle on the Tygart River. We fought through neck high poison ivy, interlaced with rambler rose and finally reached the river. The smell of creosote permeated the evening air. This spot has waist deep pockets of water, it flows around large boulders and the bottom consists of snail covered smaller rocks. Hiding spots and food sources abound. I tied a crayfish imitation to my leader. On the first cast, the fly snaps off behind me on the dog leash. The next cast isn’t much better, I’m standing on the main line. The fly lands about eight feet away and is ravaged by a three inch rock bass. The next dozen or so casts result in a couple of eight inch smallmouth and too many lost flies. Time to try fishing on the surface. As I dig through my fly box for a popper, I notice a few flies that I had never tried before. They are Clouser floating minnows. I tie on a black one and the first drift results in a foot-long smallmouth from a log jam. The next cast is a repeat. Then a beagle falls off the logs into the water. We move upstream to a table-sized flat mid-stream rock. The fly floats on the surface a few feet in front of me as I strip out line for a cast. It dips and darts with the current looking just like minnow feeding on minute organisms. I quickly realized that you don’t need to cast this fly. Just let it drift into likely cover from an upstream position and let the current and the fly do the rest. The old Simon & Garfunkel song came into my mind and wouldn’t go away. This fly just slips and slides away until it is engulfed by a fish. Yeah, I know that a real feeding minnow would be moving upstream, but the fish don’t seem to care. I began using a no-slip loop knot to impart even more movement to the fly. I fished using this method a couple of times per week, until floating masses of algae forced me to quit. The fly consistently caught smallmouth and largemouth bass, rock bass, bluegills and pumpkinseeds. I didn’t catch anything big, but anything is good enough for August. I did have a rock bass on one evening that was eaten by a Muskie. So, if you are looking for something to occupy a steamy August evening head for the river and let time slip-slide away. Don’t forget your hard-headed dog. They don’t think much of August either. 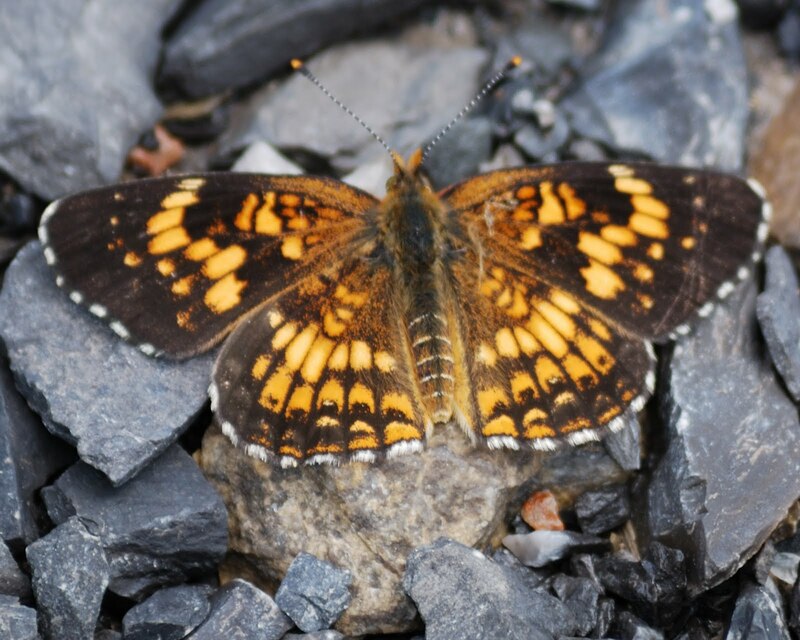 The Harris' Checkerspot (Chlosyne harrisii liggetti) is a common butterfly of higher elevations. The larvae feeds on the Flat-top White Aster (Aster umbellatus), which grows only in high mountain bogs. This butterfly is very common in the Canaan Valley area. Look for this species in June and July, while on your high mountain tours. The Queen of the Prairie (Filipendula rubra) is a fragrant wildflower of moist meadows. The flowerheads are 5-6 feet tall. This plant is threatened or endangered over most of its native range. This image was taken near Glady Fork in Randolph County,WV. Look for these rare beauties in June and July. Many of you are wondering; where is High Virginia? High Virginia is wherever you want it to be, as long as it is in the mountains of Appalachia. I know that many individuals are not comfortable without borders and definitions. So, here is my image of High Virginia. We will begin at Marlinton, WV and make it the SW corner. From there we will follow Rt 219 north to Thomas, WV. When we reach the bridge over the North Fork of the Blackwater River, we will turn right onto Rt 32 and travel through Thomas to the Rt 93 intersection. We will then travel on Rt 93 to Scheer,WV and follow Rt 42 south to Petersburg,WV. In Petersburg we will pick up US Rt 220 at follow it south until we reach Warm Springs,VA. When reaching Warm Springs we will turn onto Rt 39 and head west right back to Marlinton. We now have boundaries and everyone is happy. As I have gotten older, I now realize that everything that I need to see or experience can be found within these borders. Get out and explore and this region will charm and impress you. Enjoy. Harvest time is here; the aroma of homemade spaghetti sauce permeates the home. It is made with care, using only the freshest ingredients: basil, peppers, tomatoes, onions and dried up, flavorless garlic, imported from California or China. You can do better than that. Nothing is simpler or less labor intensive to grow than garlic. It doesn’t require large spaces or tender loving care to be happy. You do need to acquire your bulbs now. Waiting until late September or early October will leave you disappointed. Start looking for your bulbs now. Farmers markets or local growers are a good starting point. They are harvesting their crops now and should have a surplus. Mail order and on-line seed suppliers are another good choice. I have my best production with the hard neck varieties of Siberian and German Extra Hardy. Polish Softneck is also a good choice. When you have acquired your bulbs, the hardest part is over. In October, sometime around or shortly after Columbus Day, turn off the football game and go out to your garden area. Spade up your selected spot, about three feet wide and 10 feet long. This will allow you plenty of space for one pound of cloves. I like to plant mine in a border, around the area that I plan to put cabbage and broccoli in next spring. This seems to help confuse Cabbage Butterflies. Separate your cloves, plant each clove blunt end down, pointy end up, four inches apart and two inches deep. You can plant in rows or whatever pattern you desire. Garlic doesn’t care, as long as it is spaced properly. Cover the cloves as you plant them. Add some compost or organic fertilizers to the top of your bed at this time. By Thanksgiving, you should see new garlic sprouts emerging. When the ground freezes for the first time, throw about two inches of straw on top of your plants. Now; the next step is to leave them alone; until spring. Garlic plants may have a growth spurt if there is a warm period in January. Do not add additional straw to top them off at this time. You will smother the plants. I learned this the hard way. Your plants will start growing quickly; when the daffodils start shooting up. Carefully rake the straw from your plants. Don’t worry about frost, it will not hurt your plants. They may look ugly for a few days, but they will recover finely. When the tops reach a height of around ten inches, sprinkle a couple of hands full of blood meal around your plants. Do this again in late May and just leave them alone. This is real time consuming, isn’t it? During mid to late July, you will notice your leaves beginning to turn yellow. When the top two or three leaves turn brown, it is harvest time. Do not try to pull your plants. Dig up the individual bulbs. Rinse off any excess dirt, hang the entire plant in a shaded area, with air circulation. Do not try to dry the plants in direct sunlight. I dry mine in a gazebo, hanging from the rafters. When the foliage is brown and dry; cut it off. Leave about one inch of stem and snip off the roots at the base. You will have all the fresh garlic you will need. Store the excess in paper bags, in your refrigerator crisper. Keep some to plant for next years crop. The excess will store well for four to six months. This was simple and not very time consuming wasn’t it? Enjoy. The clear-cut bakes, in the afternoon sun. Jewelweed wilts. A doe arises from her bed. She is thirsty and heads toward her favorite water source; a spot where water drips from a rock outcropping. She doesn’t have her pair of fawns to worry about. They were consumed by coyotes shortly after birth. She carefully moves downhill, through a blackberry thicket. Stopping near the edge of the logging road, she allows a trio of four-wheelers to pass. They disappear, she hurries across the road, nearing the sound of a swift flowing stream. She doesn’t water here, the water smells odd and has an acrid taste. She crosses the hemlock- shaded shallows. Deer flies swarm around her, she makes her way across the water. One fly is stunned by her flicking tail. The fly lands on its back and begins a downstream journey. The northward flow takes her through swift, boulder strewn rapids. She emerges from the hurried current and swirls into a deeply shaded pool. She can see a patch of blue sky, as it peeks through the hemlock canopy. Onward she bobs, through a series of pools and rapids. Floating in the cool water, bobbing and swirling, she has by now been on her journey for a mile downstream. Riding the swift flow, she shoots between two huge rocks and glides into a long deep pool. The depth of the pool is nearly 10 feet deep, even at the summer’s low flow. She floats onward , seeing nothing except the shimmer on the water and an occasional water strider. She is stuck in a small mat of hemlock needles. The water’s velocity picks up; she starts into swifter water. The gradient is less now, her last quarter of a mile is through gently flowing riffles. The stream is getting wider and slightly warmer. She passes the legs of a Great Blue Heron, a muskrat sits on the muddy bank. The water course is changing directions, flowage is hitting her from the east, as she is being carried to the north. Slurp! She is consumed by a baby smallmouth . Why was the journey of our fly so lengthy? The fly’s travels were in Roaring Creek, a tributary of the Tygart River, in Randolph County, WV. Roaring Creek is dead. Downstream from Coalton, aquatic life is nonexistent. I can remember, stories from old-timer’s of the past; they were “old-timer’s”, in the 1960’s. Stories of 16-inch native brook trout and meals of crayfish from the Roaring Creek waters. The water that once provided sustenance is no longer a producer of anything, except acid mine drainage to the Tygart River. The Roaring Creek drainage area is the western slope, on the northern end of Rich Mountain, Randolph County, West Virginia. This area is also home of the Rich Mountain Battlefield civil war site. Native brook trout are present in some of the tributaries and some sections of Roaring Creek, above the community of Coalton. The lower section, downstream of Coalton, has the appearance of a quality trout stream. The only thing lacking is water quality. The fact that trout are present in the upper sections; leaves hope that Roaring Creek is not a lost cause. The stream could be a poster child for reclamation. The WVDEP,CVI, WVDNR and Trout Unlimited, could combine their efforts to bring back a waterway that has been in its grave for a century. What an accomplishment and story that would be. Deer flies wouldn’t have a extensive journey, prior to consumption either. This article first appeared in Tale of the Pool. The newsletter for the WV Chapter of Trout Unlimited, in 2008.